Grey Matter Art honors the 10th anniversary of the Marvel Cinematic Universe by revisiting one of the first films from Phase 1, Captain America: The First Avenger! This Thursday GMA will be releasing this awesome Iron Man: The First Avenger movie poster by Alexander Iaccarino. 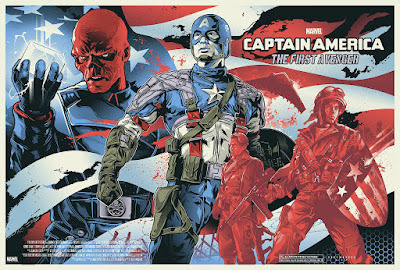 Captain America: The First Avenger by Alexander Iaccarino is a 36”x24” hand numbered screen print. Limited to 225 pieces, it will go on sale at 1pm EST on Thursday, November 15th, at the Grey Matter Art online store for $45.